Atlas Survival Action is in het leven geroepen om de mensen van de arme dorpen in de Atlas bergen ( die zich bevindt in de regio Azilal) te helpen tijdens de koude wintermaanden. lpen door hun te voorzien van kleding, schoenen, dekens, en voedselpakketten. Voor het aanleveren van kleding en schoenen hebben we diverse inzamelpunten in verschillende steden in Nederland. Kijk op onze website en Facebook naar de adressen van de inzamelpunten. www.marocrelief.nl FB: Maroc Relief Nederland. U kunt ook met geld helpen t.b.v voedselpakketten en dekens door een bedrag over te maken op onderstaande rekening. Atlas Survival Action heeft uw hulp nodig! Dus draagt u deze actie een warm hart toe?? Help ons dan om deze idorpelingen de wintermaanden door te komen! Telefonisch: mw. N. Bouhafid, 06-84110131. Maroc Relief en deze dorpelingen in het Atlas gebied hopen op uw sponsoring te kunnen rekenen! GAZA CITY (Ma’an) — Islamic Jihad will not adhere to a Nov. 21 ceasefire deal to end recent violence in Gaza if the group’s secretary-general is banned from entering the coastal enclave by Israel, a senior group official said Sunday. “We had hoped that Dr. Shalah could have visited Gaza accompanied by Hamas leader Mashaal, but the Israeli occupier had a different opinion,” Jihad official Khalid al-Batsh said during a public meeting in Gaza. The Islamist movement will not accept the Egyptian-mediated truce deal as long as leader Ramadan Shalah is prevented from entering the Gaza Strip, al-Batsh added. “We want Palestinian unity, national reconciliation and we want to see unity embodied when Shalah and the Palestinian Authority’s president Mahmoud Abbas visit the Gaza Strip along with all resistance factions,” the official said. Israel threatened to assassinate Islamic Jihad leader Ramadan Shalah if he enters the Gaza Strip, causing the party to reconsider a planned visit, sources said Thursday. Egyptian authorities told Islamic Jihad that Israel rejected the visit and would target leader Ramadan Shalah and his deputy Ziad Nakhla if they went into Gaza, sources close to the discussions told Ma’an. 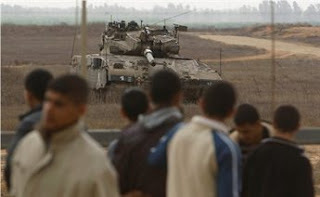 Israel launched an 8-day assault on Gaza that ended Nov. 21 with a ceasefire agreement mediated by Egypt. On 21 November 2012, Israel and Hamas came to a ceasefire agreement to end the 14 day attacks that had killed many and injured hundreds of innocent civilians starting 14 November.The terms of the latest agreement include ending all hostilities by Israelis and Palestinians, and facilitating the freedom of movement and transfer of goods within Gaza. Though mainstream media has been silent, Israel has violated these simple truce points continuouslysince they were agreed upon. Not only are the crossings still very restricted, but the fire into Gaza continues, with the first one occurring only four days after the truce agreement. For Khaled Meshaal, the chief-in-exile of Hamas’s political bureau, to arrive in Gaza on his first-ever visit to take part in the celebration of the 25th anniversary of the movement’s foundation on Saturday is by all measures a historical event that calls for present and future contemplation, said the London-based daily Al Quds Al Arabi in its editorial. The Gaza Strip is the first Palestinian territory that forced Israeli military forces to withdraw. It may be the only host environment for the Palestinian resistance and its affiliations. “It is true that the strip is besieged from the land, the air and the sea by the Israeli occupation forces and that it can’t be qualified as wholly liberated,” the newspaper said. Mr Meshaal’s visit is highly significant for more than one reason. The most important of them is the fact that it indicates that there has been political and personal reconciliation between Mr Meshaal and a number of his detractors from within the Hamas leadership in Gaza. This internal Hamas reconciliation paves the way for a Hamas-Fatah reunion that would bring together all Palestinian factions under one banner. “In fact, a sizeable Fatah delegation was present at the welcoming ceremony given to Mr Meshaal at the Rafah passage and they later took part in the anniversary festivities. This is a notable indication of an imminent and anticipated rapprochement between the two poles of the Palestinian political equation,” added the article. Equally important is the fact that the resistance chief’s visit followed a victory by his movement in the latest Israeli aggression against Gaza. It was a military triumph that could lay the political groundwork for a possible recognition of Hamas as a viable political party, the paper said. It is worth mentioning that Mr Meshaal wouldn’t have been able to travel to the Strip if it weren’t for Egyptian cover and Israeli approval. This means that Tel Aviv’s veto over him has been lifted. This, in turn, leads to the conclusion that Israel is seeking to validate the truce agreement and to encourage Hamas to uphold it, too. Mr Meshaal’s wing within the resistance movement is the more moderate and Israel is clearly seeking to promote it over the other more extremist wings that insist on continuing the fight and launching missiles. “Mr Meshaal’s visit to the Strip, the UN recognition of Palestine as an observer member state and the resistance’s recent triumph are three important factors that put the Palestinian issue on the world’s political map once again,” concluded the newspaper. Dizzy from their historic accomplishment at the UN General Assembly last month, Palestinians must not let their sense of achievement bog down their struggle, wrote Barakat Shlatweh, a columnist with the Sharjah-based newspaper Al Khaleej. Nothing has fundamentally changed on the ground with Palestine’s new non-member observer state status at the General Assembly, he said. In fact, Israel was quick to make the point that it is the dominating force in the occupied Palestinian territories. Immediately after the declaration of Palestine as the 194th member of the international community, Prime Minister Benjamin Netanyahu was already working to push through fresh settlement plans – about 3,000 new illegal housing units. Mr Netanyahu has defied the whole world when faced with international objections to his new settlement plans in Occupied Jerusalem, the columnist added. “So when Palestinian officials say that they will be able to make further gains on the basis of Palestine’s new status … they must also realise that there is no time to waste,” the columnist wrote, noting that the Palestinian people’s struggle should not stop at a “protocol state”. Palestinian leaders should not expect anything concrete to come out of the recent verbal objections expressed by European countries regarding Israel’s settlement plans. “These Western threats are for PR purposes only,” he argued. Who is protecting Syria’s majority? Calls to ensure protection for Syria’s minority have been on the rise, but nobody has bothered about protection for the majority who are being bombarded by the regime, wrote Mazen Olaiwy in the UAE-based newspaper Al Roeya yesterday. The Syrian regime has been seeking to force the majority into sectarian retaliation through all kinds of provocative acts. But the wise majority has steered away from any such acts against minorities, the writer said. In response, the regime concocted in minority-populated areas destructive acts such as exploding car bombs near churches and cutting off water, electricity and communications in majority-populated neighbourhoods in multi-sectarian cities. The current sectarian provocations are unprecedented in Syria – a place where people of all faiths and sects have coexisted peacefully. It has been home to Arabs, Christians, Kurds, Assyrians, Turks, and other Muslim and Christian sects and orders. The fact that the tension started to appear following the outbreak of the revolution proves it is not from the people but from a regime which is trying to sow dissent among them so that minorities rally around it against the majority – its top enemy, the writer noted. President Mahmoud Abbas speaks during the Arab Peace Initiative Committee Meeting in Doha December 9, 2012. DOHA (Reuters) — Arab states agreed to provide the Palestinian Authority with a $100 million monthly “financial safety net” to help President Mahmoud Abbas’s government cope with an economic crisis after the United Nations granted de facto statehood to Palestine. Israel has responded to the Nov. 29 UN vote by ordering 3,000 Jewish settler homes be built in the occupied West Bank and announced it would hold back payments of customs duties it collects on behalf of the Palestinians to pay an outstanding electricity bill. In a statement on Sunday after a meeting in Doha, Arab foreign ministers called for the immediate implementation of a resolution passed at an Arab summit in Baghdad in March, which called for the provision of a $100 million monthly safety net. The statement did not give details of how the money would be paid or who would pay, but Arab League Secretary-General Nabil Elaraby said a mechanism has been agreed. “The mechanism is that the chair of the committee (Qatar) and the secretary-general will contact each country with the exact amount they have to pay,” Elaraby told Reuters after the meeting. “I said I want an answer in 15 days,” he added. Israel and the United States opposed the UN General Assembly’s upgrade of the Palestinians’ status to “non-member state”, saying Abbas should instead resume peace talks that collapsed in 2010 over Israeli settlement-building. The World Bank and the International Monetary Fund said in September that a gathering crisis in the Palestinian economy would worsen unless foreign funding increased and Israel eased long-standing curbs on development. In a separate report, the World Bank also forecast a $1.5 billion Palestinian budget deficit for 2012, with donor funds expected to cover only $1.14 billion of this shortfall. Last Thursday, the Palestinian cabinet said at a meeting in Ramallah that $240 million were needed every month to meet demands arising from the Israeli decision to stop customs revenues transfers and the failure of donors to transfer previously pledged funds. The Palestinian Authority exercises limited self-rule in the West Bank and receives most of its aid from the United States, the European Union and Arab states. But over the past several years there has been a shortfall in aid coming from Arab states resulting in the PA being unable to pay salaries to its 153,000 civil servants on time on several occasions. The administration has yet to pay November salaries following Israel’s decision to withhold money transfers. The Arab ministers also called for convening of a donors’ conference to discuss ways to support the Palestinian people in the West Bank and discuss reconstruction in the Gaza Strip. Qatar’s ruler, Sheikh Hamad bin Khalifa al-Thani, pledged $400 million to help develop Gaza during a visit there in October. Israel should define its borders, even if this means doing so unilaterally, and separate from the Palestinians, former IDF chief of General Staff Gabi Ashkenazi said Sunday. Ashkenazi’s statement, which amounted to a call for Israel to unilaterally withdraw from much of the West Bank, followed similar statements from other high-ranking officials over the past several years, the result of mounting frustration over the lack of a peace settlement and Israel’s continued hold on the West Bank. Ashkenazi said Israel should not necessarily wait for a peace deal to pull out of the West Bank, but did not say where borders should be drawn, saying only that they would need to have wide purchase among Israelis. Israel carried out a similar move in 2005, when it left the Gaza Strip without an agreement with the Palestinians in place. Earlier this year, Defense Minister Ehud Barak floated the idea of Israel pulling out of the West Bank on its own if talks with the Palestinians failed to see any progress. Ashkenazi served as chief of staff from 2007 to 2011. Though widely thought to be eyeing a political career, current law requires high-ranking army officers to wait three years before entering the political arena. In turn, Abbas warned Israel not to withhold tax revenues that were to be transferred to the Palestinian Authority, saying he would go to the International Criminal Court if Jerusalem did not honor its agreements. GAZA CITY (Ma’an) – Palestinian prisoner Muhammad Adel Hasan Dawood, 47, on Saturday completes his 25th year in Israeli jails bringing the number of Palestinian prisoners who served more than a quarter decade to 22. According to the director of Gaza-based Palestinian Prisoners Center for Studies Riyad al-Ashqar, Dawood, from Qalqiliya in the northern West Bank, was detained Nov. 8, 1987, and sentenced to life. An Israeli military court convicted Dawood of carrying out an attack against settlers at the bypass road south of Qalqiliya killing a number of settlers. Israeli forces then demolished his home. There is an urgent need for all the Palestinian forces to come together and speak with a single voice. The time could not be more appropriate for all efforts to be channelled in support of the Palestinian cause. The recent comments by Hamas political leader Khalid Mesha’al, on his first visit to Gaza in decades, do not take into consideration the ground reality with regard to where the Palestinian issue stands. Mesha’al was visiting Gaza to join in the celebrations for the 25th anniversary of the founding of Hamas. The rights of the Palestinian people to exist and establish an independent state is one that can be argued or debated as it cannot be nullified. Neither can any party eliminate the Palestinians’ right to freedom and to attain their basic human rights. However, what Mesha’al should have focused on was the need for national unity and the best means to achieve it. After all, nothing is harming the Palestinian cause more than the disintegration of relations between the leaderships in Gaza and the West Bank. Having said that, it is critical for Hamas, as much for the Palestinian National Authority (PNA), to mend fences and come together, under a single umbrella. This is being said given the fact that the Palestinians had bid for a non-member seat at the United Nations — and had successfully attained it. If anything, this victory at the UN reflects the fact that the world community today is in favour of supporting Palestinian aspirations and is in fact backing their plight for their rights. It is therefore more appropriate for the leadership of Hamas to adopt steps that will unite the Palestinian people in pursuit of their aspirations. Local sources in Yatta town, south of the southern West Bank city of Hebron, reported that Israeli soldiers invaded the town, on Sunday at dawn, and kidnapped two Palestinian intelligence officers. The sources said that more than 30 Israeli military vehicles invaded the town shortly after 2, broke into the homes of the two officers, violently searched them, and kidnapped the two. The officers were identified as Ahmad Ali Bheiss, 40, and Khalil Mohammad Abu Eid, 48. The two were cuffed and blindfolded before being kidnapped and taken to an undisclosed location. Rateb Jabour, coordinator of the Popular Committee against the Wall and Settlements in Yatta, reported that the army recently increased its attacks against Yatta, and kidnapped several members of the Al-Aqsa Brigades, the armed wing of Fateh, who were previously wanted, and were pardoned by Israel after the group was disbanded in the West Bank. Jabour also said that several residents and members of the nonviolent popular movement against the wall and settlements have also been kidnapped. On Friday evening and on Saturday at dawn, the army kidnapped nine Palestinians, including three children, in different parts of the West Bank. Tel Aviv’s plan to construct more illegal settlement units on occupied Palestinian lands has exposed the ‘political insecurity’ of Israeli Prime Minister Benjamin Netanyahu, a new report says. Citing Israeli analysts, the Friday report accused Netanyahu of trying to “cement support among those Israeli Jews who have considered forgoing voting for his right wing Likud movement and instead choosing more radical, pro-settler parties”. On November 30, Israel approved a plan to build 3,000 more units in East al-Quds(Jerusalem) and the West Bank, including in the controversial E1 area, in response to the UN recognition of Palestine as a non-member observer state the previous day. The report highlighted that the move announced by the Israeli prime minister was also aimed at testing Tel Aviv’s Western allies to assess how much support Israel could lose if it goes ahead with Jewish settlements. The premier “is probably preserving for himself the option of retreating when he sees that international allies are starting to be serious” in their condemnation of the settlement plans and possible sanctions against Israel, the report quoted an Israeli analyst as saying. Many countries have censured the Tel Aviv’s regime over the settlement expansion plan. At least eight countries have summoned Israeli ambassadors in the past week to protest the plan, including close allies such as Germany, Italy and Britain. The report added that Netanyahu’s decision last month to launch an eight-day military operation in the Gaza Strip was also “at least partly attributed by commentators to his ambition to gain support from the right”, as he is uncertain of his political standing among right-wingers. More than half a million Israelis live in over 120 settlements built since the 1967 Israeli occupation of the Palestinian territories of the West Bank and East al-Quds(Jerusalem).